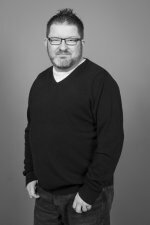 I think I may have mentioned before in this blog that when I was young, my family would all go for walks from Leigh-on-Sea to Southend, stopping off at various watering holes (pubs) for a drink. Being young, we would have to sit in the family rooms of such pubs like The Peterboat, Ye Old Smack, The Cliffs Pavilion, The Shambles, and The Foresters Arms to name a few. Anyway, the one thing these pubs all had in common (besides selling booze!) were a great assortment of arcade games, namely Carnival, Pac-Land and Commando. 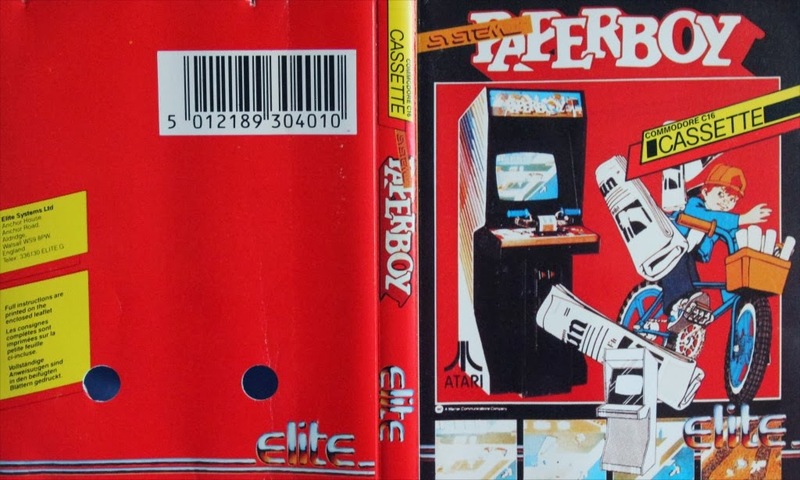 I would spend a fortune on these, but the highlight of these walks was finally reaching Southend and spending loads of my pocket money in the arcades on one classic game that I still love playing today…… Paperboy. 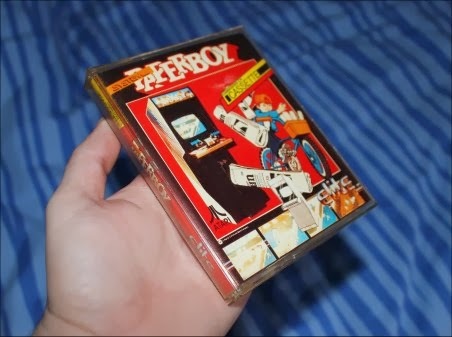 I never considered myself an expert at the game, but I used to fly through the levels, picking up the newspapers, and throwing them at the doors of subscribers, whilst avoiding road-workers, drunks, radio controlled cars, break-dancers, and other obstacles. On many occasions I had a large crowd standing behind me, watching and cheering me on. It actually made me feel good! The original and best... The arcade version. 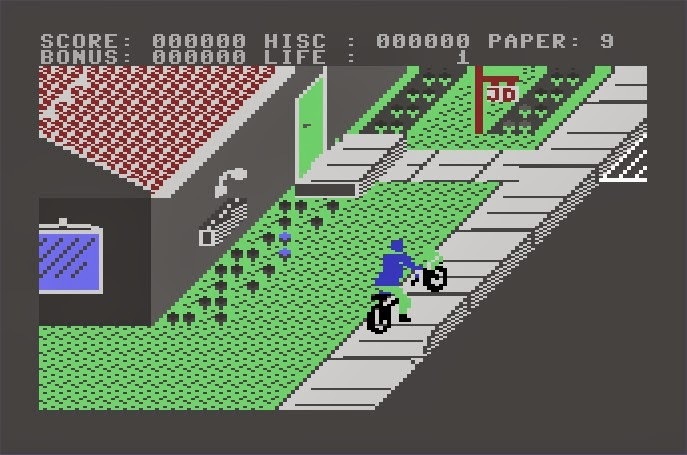 Back in 1986, I was excited when I found out that Paperboy was coming out on the Commodore Plus 4 (our family computer at the time). I remember getting the game from Software Plus in Basildon, getting home, loading the game for the first time, only to find the conversion a complete and utter pile of pooh! Actually, looking back at the game, the conversion wasn’t all that bad considering the limitations of the Commodore Plus 4 – As with many games on the system, it was also made to work on the lower spec Commodore 16. I’m sure a version made specifically for the Plus 4 would have been much better…… ANYWAY….. The Commodore 16 and Plus 4 Version. A good attempt at a conversion, considering the limitations of the computer. 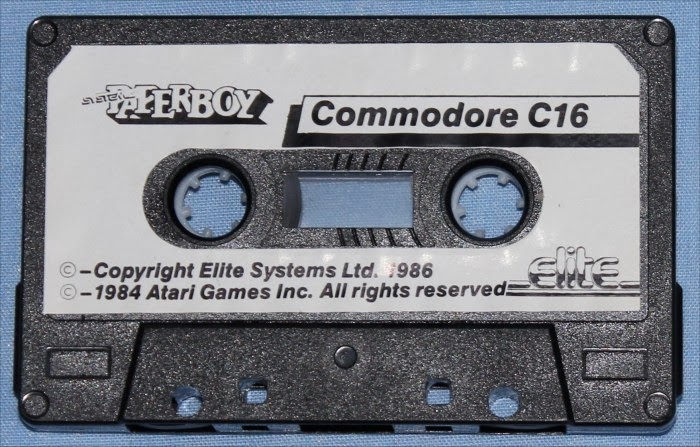 When I got my Commodore 64 for Christmas in 1987, one of the games that came with the computer was the C64 conversion – and WOW…. It was amazing. 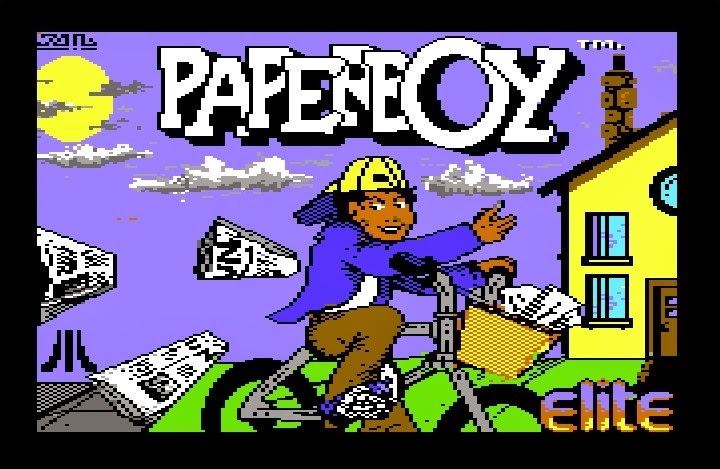 Paperboy, the first game to feature a non-white character? Nah, just the limited C64 colour palette! Well, it was at the time. Besides the blocky graphics, it was just as good as the arcade (just without the handlebar joystick), and included the training course which was missing in the Plus 4 version. 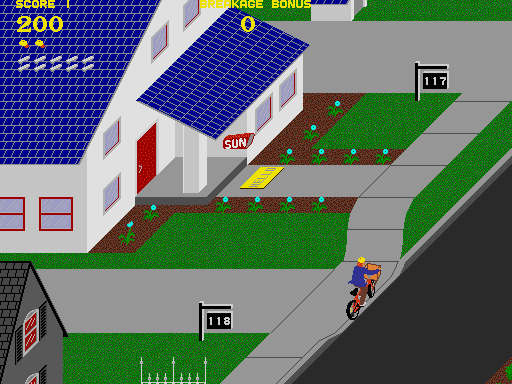 The game was simple – You played the paperboy and your task was to deliver newspapers along a suburban street shown in an isometric 3D view. 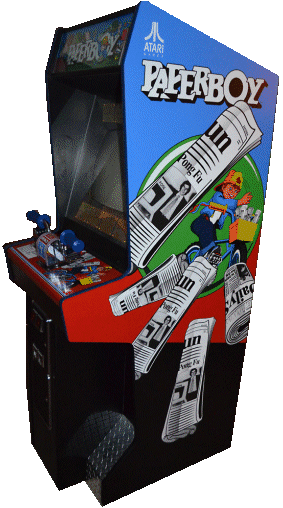 If you ran out of newspapers, you would have to collect more and you could also damage/vandalise non-subscribers houses by throwing newspapers at their windows and other items located in their front gardens to boost your score. If you deliver a newspaper to every subscriber’s house, a non-subscriber becomes a subscriber the following day. If you miss a subscriber’s house, they become a non-subscriber on the next day. The game starts on Monday and you need to get all houses to subscribe to the newspaper by the following Sunday. Try not to hit the guy going for a morning run! Sounds easy? It would be if it wasn’t for break-dancers, cars, skateboarders, drunks, cats (and even the Grim Reaper) getting in your way. You also had to cross an intersection in the road which required the player to dodge traffic. 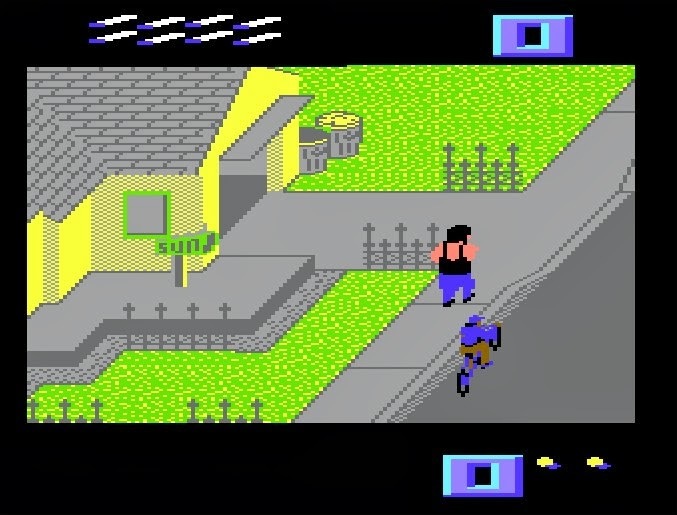 Some obstacles could earn the player additional points such as throwing a newspaper at a burglar trying to break in to a house, or hitting one of two men having a fight in the middle of the street. A non-subscriber. Smash some windows! At the end of the street, the player would then need to complete a training course for additional points (and to improve your throwing aim). If you crashed on the course, you would simply just start the following day without the bonus points of completing the course. 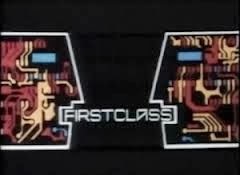 The game was also featured on one of my favourite shows in the 1980s – a gameshow by the BBC called First Class which had young contestants play against each other on a variety of popular computer games at the time (720, Hypersports, and of course Paperboy). 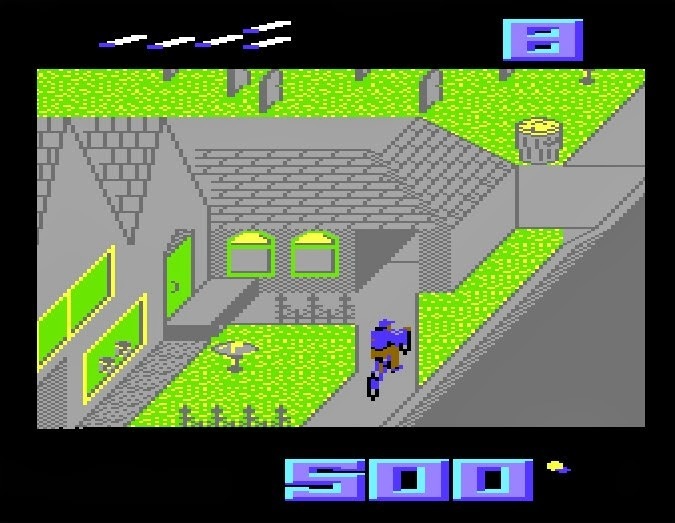 Title for the BBC kids show "First Class" which featured Paperboy as one of its games. The cover for the Commodore 16 and Plus 4 - The graphics were so bad, they didn't even put screenshots on the back of the cover!